Designed for an excellent listening experience, Mpow Bluetooth headset with CSR chip and around-ear cushion design can provide robust, immersive and Hi-fidelity sound. The Bluetooth headset can easily and quickly connect with smartphones, tablets, TVs and other Bluetooth devices within 33 feet, bringing you crystal clear sound effect. PLEASE make sure the driver software of receiving adapter is fully updated when connected to PC or laptop, and you need a SEPARATE Bluetooth adapter when connected with TV. The foldable design makes it easy to store them when not in use or during travels. The stainless steel slider headband allows you to find the perfect fit and provide excellent durability. In the wired mode: Used as a wired headphone with an audio cable. 1. Please keep the headset in dry and cool environment as the earmuff is made of memory-protein materials. 2. The microphone only works in the wireless mode. 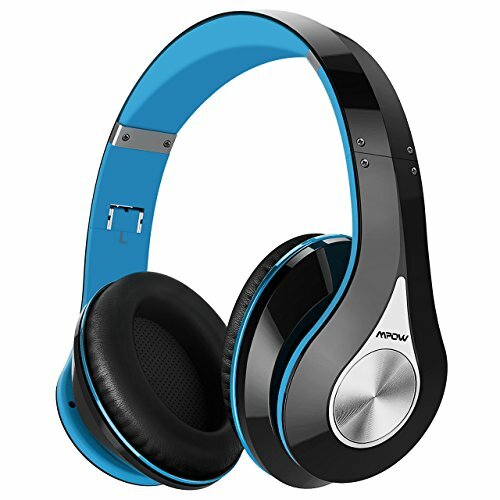 HANDS-FREE CALL & BUILT-IN MIC: Mpow Bluetooth headphones provide a quick and stable connection with your Bluetooth enabled devices like cell phones, tablets, pc, TVs within 33 feet, with a high-quality built-in microphone for hands-free calls. Note: The Microphone only works in the wireless mode.